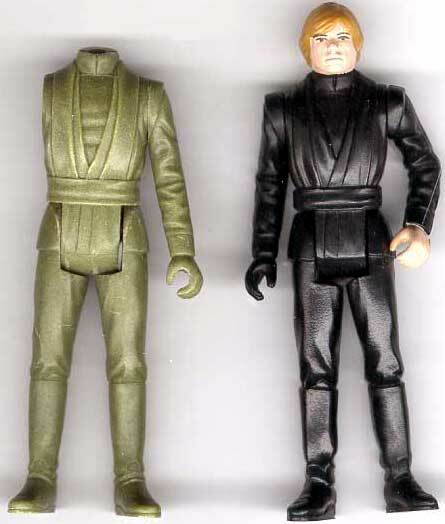 The piece you see on the left of this first photo is an incomplete hardcopy of what I presume is an early sculpting for the Luke Jedi figure. By comparing it to the production Luke Jedi figure to its right, you should be able to see how it differs from the final product. Although the general details of the outfit are the same on both pieces, the production figure is more relaxed and looser looking. The folds are softer and more naturalistic on the production figure's outfit, and several details are completely different. For instance, the folds on the chest visible beneath the character's tunic on the prototype are not present on the released figure. Most obvious, of course, are the differences in the two figures' left arms (seen on the viewer's right). 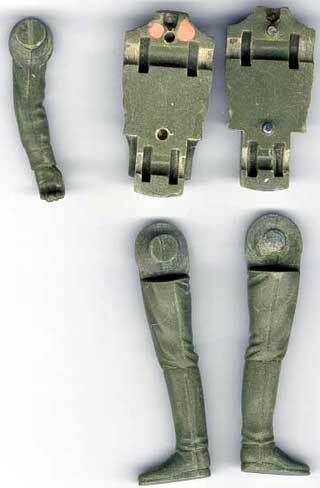 Where the prototype has a somewhat straight left arm, that of the production figure is bent at the elbow. Here's the back view. Again, notice the differences in the folds of the outfits. They're particularly noticeable on the upper parts of the figures' legs. Also notice the slight contrapposto pose of the production figure: one of it's legs is slightly angled, making it appear to stand in a natural, relaxed way. The prototype, however, stands more-or-less pin-straight. Lastly, here's a shot of the interior of the hardcopy. Most Star Wars hardcopies were constructed with a solid torso piece; the head and limbs were attached to it via pins, which could be inserted into corresponding holes at the joints. Some, however, utilized a two-piece torso, which held the limbs and head by clamping down around raised disks incorporated into their designs. Here you can clearly see the grooves that are present in the torso's interior for the purpose of holding these disks. You can also see the raised disks on the limbs (the disk on one the legs is broken off). As you can see by looking at this piece, the torsos and limbs of acetate sculptings were usually designed in this manner. 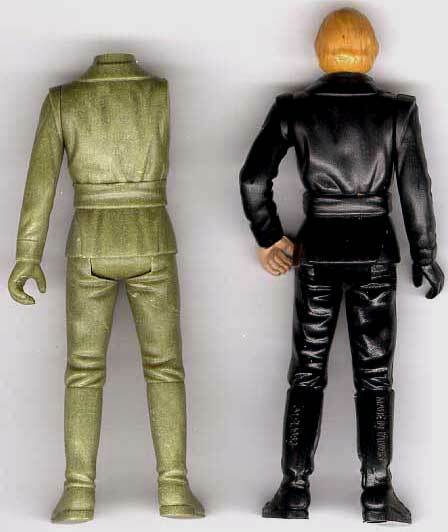 In my opinion, it's quite possible that the Luke Jedi figure was originally sculpted in acetate and then modified in wax. Since the hardcopy you see here has the attributes of an acetate figure, it's possible that its parts were cast directly off an acetate sculpting. This would account for its complicated construction, as well as its rather stiff appearance. From the start of the Star Wars figure line, Kenner sculptors were constantly working to make their product seem less rigid and more naturalistic. In fact, many of the acetate sculptings returned to them from Kenner contract sculptors were later modified in wax in order to soften their appearances. In the case of Luke Jedi, I believe it's likely that it was first sculpted in acetate, and a hardcopy much like the one you see here was created. Kenner then made molds of the acetate sculpt (or of its hardcopy), made wax copies of it, and modified certain portions of it in order to give the figure a slightly different look. Whatever the case may be, evidence of alternate sculptings is always interesting, as it suggests to us the amount of care that went into making these toys look just right.